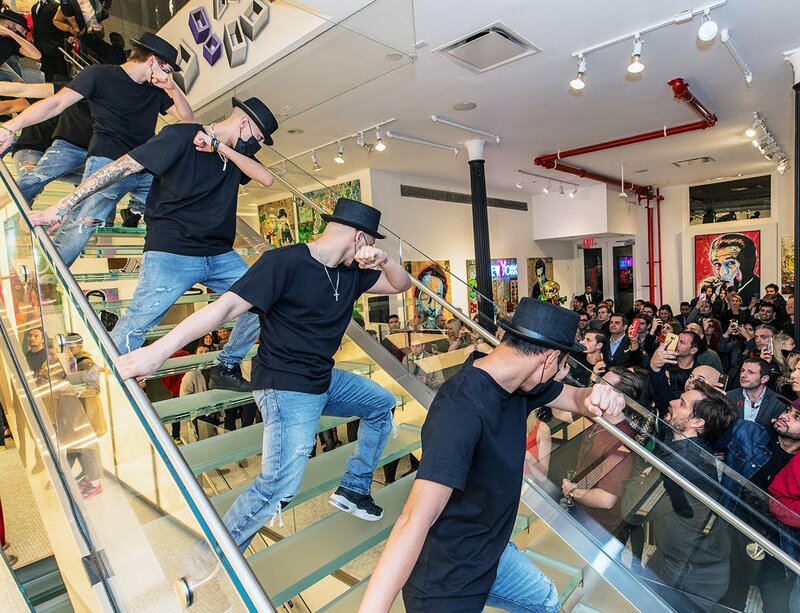 Last night, renowned celebrity graffiti artist, Alec Monopoly, celebrated his 32nd Birthday party as well as his exclusive representation by Eden Fine Art with the opening of his latest exhibition at the SoHo based gallery. The show was primarily inspired by Robert De Niro’s films (including Heat, Godfather, Taxi Driver and Goodfellas, among others), as well as his signature muse: the Monopoly Man. 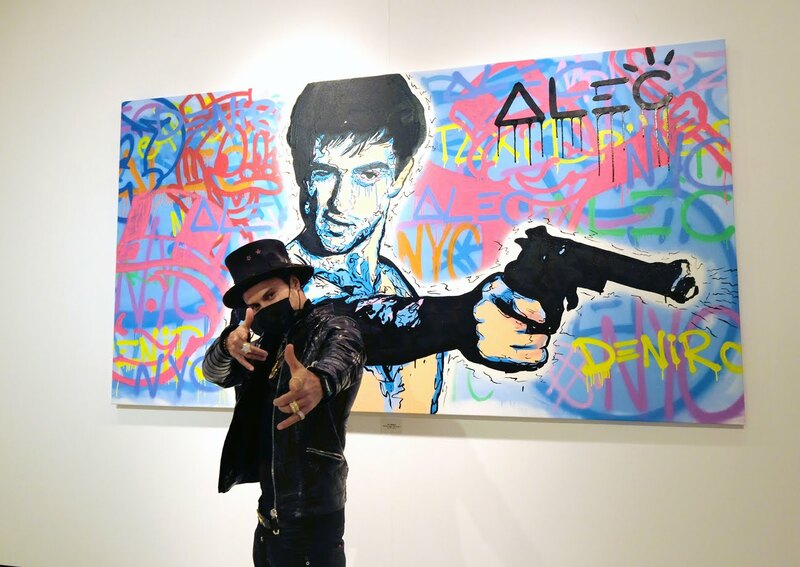 Alec Monopoly is the alias of the unidentified art provocateur who never reveals his face. This marks the native New Yorker’s first NYC-based exhibit in over 10 years. He first gained notoriety after the 2008 market crash, and is well-known for his meta-narrative exploring socio-politics and iconic pop culture characters in urban spaces. More recently, he has collaborated with names like Madonna and AVICII and brands including Philipp Plein and Tag Heuer. The party, which unveiled over 25 new pieces of art, also featured impromptu dance performances throughout the 4-level gallery, sounds by celebrity DJs Alexandra Richards and Alix Brown, food trucks serving savory fries out of Monopoly-inspired top hats, and a custom designed graffiti cake. 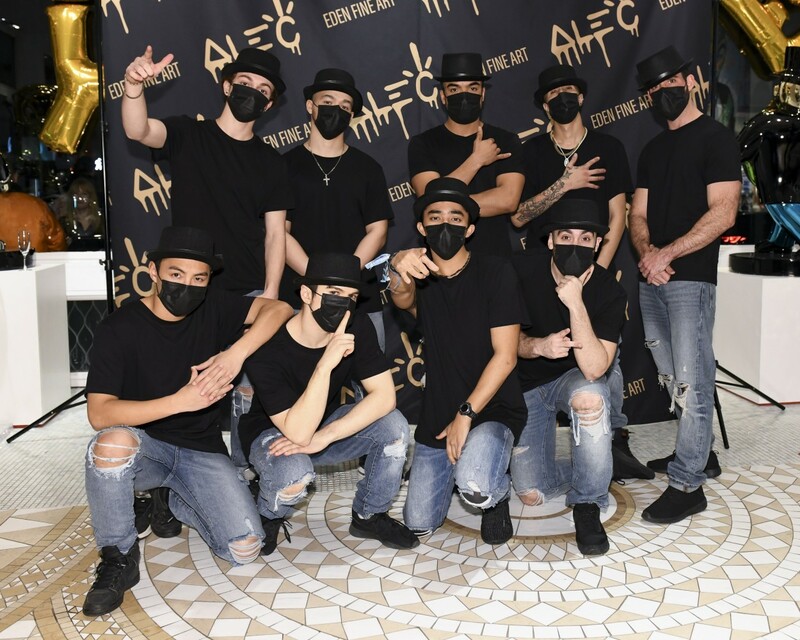 Notable attendees included: The Clermont Twins, Julia Fox, Niki Takes, Nicole Pollard, Logan Horne, Ezra J William, Nick Murphy (aka Chet Faker), Alex Carapetis, Oskar Metsavaht, Vika Levina, Riccardo Ambrosio, and Alex Ordonez. Eden Fine Art is an international gallery owned by Cathia Klimovsky. Founded in Jerusalem in 1997, there are now 10 galleries in the world’s most prime art locations including New York, San Francisco, London, and St Barth.